I love food. And everything else that surrounds food. Conversation, relationships, places, and memories. When I crave a particular dish and attempt to recreate it in my kitchen, I often discover a connection to a person, a time and a feeling. I am therefore teaching myself to cook. By cooking each day. With recipes that are collected verbally on the phone, that are sometimes typed into Word, scribbled on post-it notes, occasionally learnt by watching over someone’s shoulder. That could be a giant experiment to find a missing flavor and satisfy a certain desire that won’t go away. I talk to both my mother and mother-in-law, refer to various cookbooks, find friends who make the dish well, and try to document the final recipe before it fades from memory. Often, the project is a crushing failure and leads to frustrated questions such as, why are my rotis always hard and chewy? The answer usually doesn’t lie in lack of cooking practice. There will be a subtler element, like how the dough was kneaded or how hot the tava was. I’ve frequently given up in favor of take-out food and store-bought rotis. But something keeps beckoning me to the stove, to begin the experiment again. As if I wouldn’t be complete without trying once more. Your web log brings back memories from my own childhood. Sunny Saturdays spent heckling with vendors, and the small triumphant smile when we snagged a deal to incessant bouts of sneezing when ma prepared tadka… Some things have such a simple and efficient way to remain a part of our lives. I look forward to reading more of your ‘blog. I have been wondering what to cook for Anya, who is such a fussy eater. I liked the idea of making pav bhaji and love your recipe. I am going to try it with Anya. I hope she likes it. Maybe she’ll eat it if I tell her that Aaggy eats it too! I think Anya would love pav bhaji, perhaps with no chilli powder and less bhaji masala. Hi Viggy pointed me to your blog. Its great – very well written – yes brings back nostalgic memories – also very inspiring – we cook very little for ourselves and a very limited range for the kids – am inspired to try new things for my son. My daughter is just too fussy and I need to be patient with her……..
What a wonderful introduction. I love cooking and have found the best recipes come with much trial and error. Good luck on your journey. Devika, I am sitting here at work and starving. Your website makes my mouth water and reminded me of the delicious dinner we had at your place a few days back. Geeta, looking forward to doing it again soon! Mummy laughed when I said that I’m writing about pulihara today but Andhra food is so delicious! I am so very excited to have found your wonderful blog! i love, love, love indian food. now i have your recipes and stories to teach me some of my favourite dishes AND a wonderful indian market right here in fort lauderdale, fl (of all places!). thank you. I am very passionate about Indian food and would love to help guide you in any way that I can! Please let me know if you have questions about specific recipes. Just came across your blog through Foodbuzz. Is that your garden? How cool!! I live in NYC, so I can only dream of having one like this..ha ha! Looking forward to reading the rest of your posts. 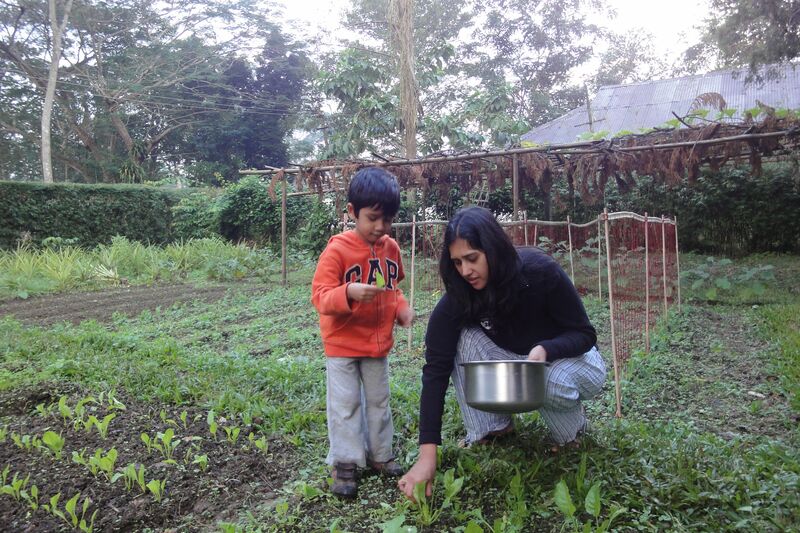 Anu, that vegetable garden is actually one that I dream of having too – it’s in Assam, at my family’s tea plantation! We were picking spinach that morning. Hi I am so glad I found your blog! My husband is from Calcutta too, and my in-law were here when our baby boy was born last year. Your blog reminded me so much of her cooking, and I can’t wait to try some recipes you posted!! Love, love, love your blog! On searching how to find rhubarb in kolkata, came across your blog..very nice.Could you let me know what will be bengali name or hindi name, here in kolkata.And how to find one in local market. Actually want to reduce LDL and SGPT, heard regular intake of these will help in reducing the above @. I have never seen rhubarb in India unfortunately.